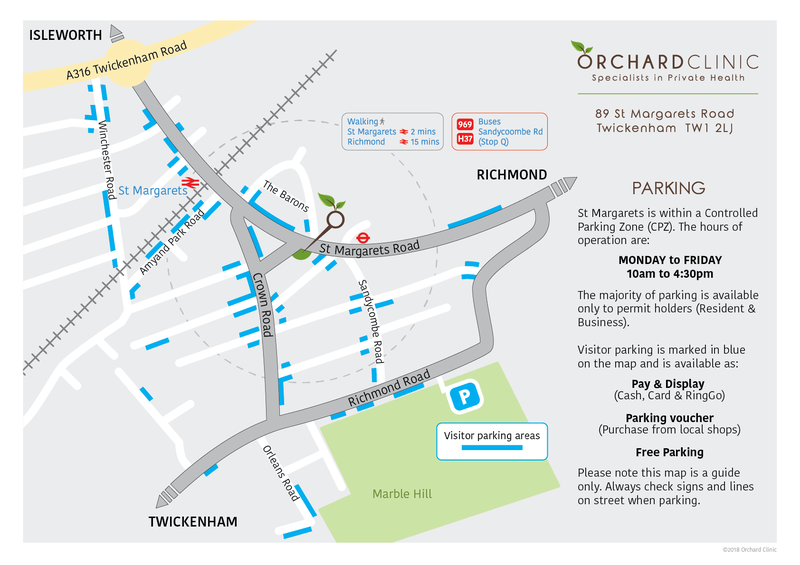 The Orchard Clinic provides private healthcare with an emphasis on addressing mental health. Our experienced team includes psychiatrists, psychologists, psychotherapists, nutritionists and specialist consultants. We see people of all ages and work collaboratively to meet the diverse needs of our clients. Patients may be referred via their GP or consultant or they may self-refer. We aim to support people in understanding the treatment options available to them so they can make informed choices about their care. The clinical team draws on best practice advice from peer and specialist groups to provide ongoing support to our patients. The Orchard Clinic is registered with the Care Quality Commission. Dr Mays has over twenty years experience in the NHS and private practice in the UK and the US. Many of her patients struggle with depression, anxiety, work-related stress and post-traumatic stress. She specialises in cognitive behavioural therapy (CBT) and EMDR. Carol qualified as a Registered Dietician in 1977. She initially participated in obesity research and subsquently helped develop a comprehensive eating disorder service at the Roehampton Priory Hospital. She has extensive experience in treating people who have a difficult relationship with food. Dr Hopley is an experienced and well respected consultant psychiatrist who works closely with adults and older adolescents struggling with stress, depression, anxiety and addiction. Dr Hopley is also internationally recognised as an expert in the mental health of elite athletes and business leaders. Dr Key is an experienced general consultant psychiatrist who specialises in eating disorders. She works closely with a highly experienced multidisciplinary team to promote comprehensive care to patients of all ages. Dr Martin specialises in old age psychiatry but consults with people of all ages. Conditions addressed include depression, anxiety, OCD, addictions, cognitive disorders, adult ADHD and autistic spectrum disorders in adults. Dr Zwi is a Child & Adolescent Psychiatrist with considerable experience of supporting children, young people and families. His areas of work include ADHD, autism, anxiety, depression, eating disorders and challenging behaviour. Renu is our fully qualified Phlebotomist and a full-time PA to Dr Heather Mays. She is approachable with a calm and caring personality. She is meticulous with a highly organised attitude. Always happy to assist you with any queries or concerns. She has many years of experience of working within the private healthcare sector, and has acquired a wealth of knowledge. Renu endeavours to make a difference in people’s lives wherever she can. Chloe is our part-time receptionist and a valued member of the Orchard Clinic team. She is approachable, empathic and a caring person with a happy disposition. She is currently studying psychology at St Marys University, Twickenham and hopes to pursue a career in clinical psychology when she graduates. If you are feeling suicidal or are experiencing symptoms that may require urgent medical attention. Please contact emergency services on 111 or 999.